Social Media these days plays an important role in our life. 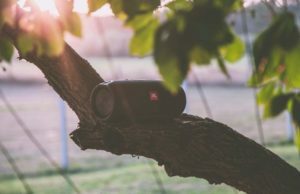 In spite the fact that, Social Media is not reality and has an entity in a virtual world only, but still, we used to get very sensitive about it. In corporate world also, an employer who is appointing an employee is very much interested to know his/her social media profiles be it Facebook or Twitter or maybe LinkedIn. Employer of big corporate houses uses the email address to find social media accounts of the potential candidate. It is important, as Social Media depicts some real deep facts about the person. 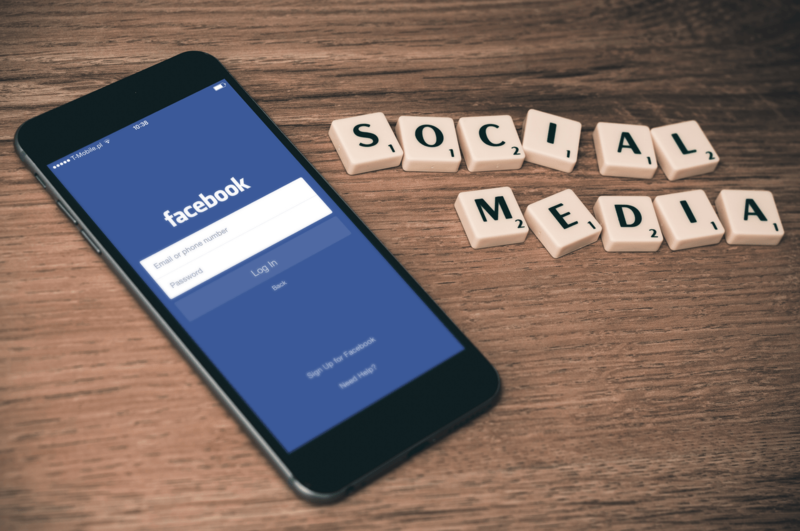 Your social media profile can effect your job profile. If you are going to meet someone tomorrow, it would be good practice to look over the social media profile of the person today. It would help you in knowing them even before meeting. 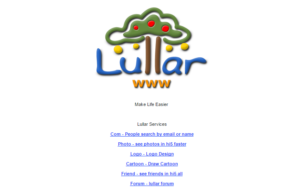 Lullar is like the little Google of email and social media database. Lullar is an online tool which would help you in finding the social media accounts using email. When I was checking out my social media accounts, it found some of that account which I created back in 2010 or maybe in 2011. So, yes this tool is quite good and also fast. Just in 2 clicks, it would give you all the Social Media Accounts of any person using email. 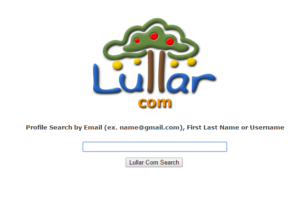 To search the social media account using email, all you need to go to Lullar.com and then choose People Search by email or name. In the next page, enter the email address of whom you wanted to search and then search. get Quick, Easy and Relevant results. ManyContacts is a Google Chrome Extension which would help you in finding Social Media Account of any person using their email address. You can install the ManyContacts Extension here. After installing the extension, it would instantly get to work. You would see Blue Tick icon on the top right corner in of Chrome. 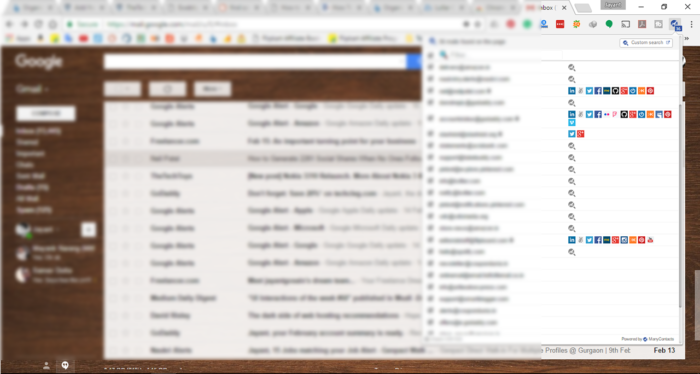 ManyContacts extension is quite intelligent and would sync your all the gmail addresses with it. You can get all the social media accounts of all those people who email you. Just click on the Blue Tick icon on the top right corner, a list of contacts will appear showing you social media profiles. 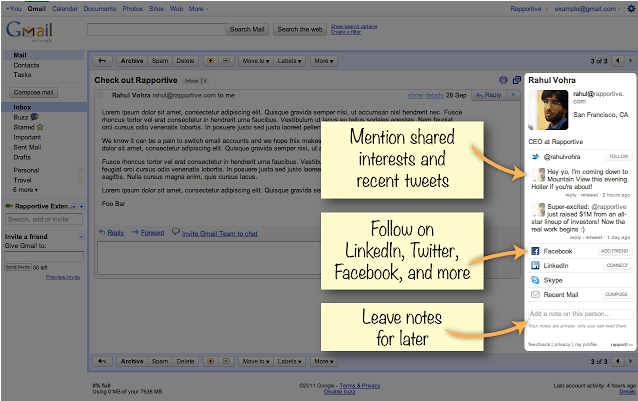 Rapportive is yet another Social Media extractor using email. Using it, you can get the LinkedIn profile of the person. Whenever you got a new email, Rapportive will get activated and show you LinkedIn profile of the sender. Download here. Moreover, you can also get details of the app they are using for email marketing. If the person is using MailChimp, you would get the details MailChimp activities of the sender. So, these are some of the ways which would help you in finding social media accounts by email address. 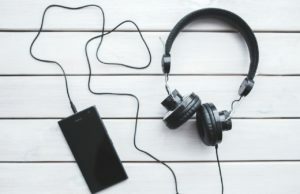 Using these extensions and online tools, you can get all the social media accounts of your potential employee or your future business partner. Let me know any other tool you know for finding social media accounts using email. Don’t forget to Share it with your colleagues and office friends for better understanding. Your post saved my precious time to search on google. Your article has given me some more insight about Find Social Media Accounts by Email.